Reviews | 30 oz. White Bulk Soap, Sanitizer, and Lotion Dispenser (IMP 9330) - 4 1/2" x 4" x 6 1/4"
30 oz. White Bulk Soap, Sanitizer, and Lotion Dispenser (IMP 9330) - 4 1/2" x 4" x 6 1/4"
Ensure your staff and guests' hands stay clean with this easy-to-use 30 oz. (880 mL) white bulk soap, sanitizer, and lotion dispenser. It's proven to work with all antimicrobial, antibacterial, and antiseptic liquid soaps, sanitizers, and lotions, and, thanks to its convenient, wall-mount design, it's always easily accessible and highly visible. Just attach it to your wall with the adhesive on the back of the dispenser, or use the built-in keyhole slots to mount it to the wall with screws. Either way, this dispenser dispenses 1 mL (.03 oz.) with each pump. That's more than 850 times before a refill is necessary! This leaks. Also, each press only dispenses a small amount. That's OK, but it comes out very slowly, even using the recommended soap, so if you pull your hand away too soon, the last bit will drip. And, it simply drips very small amounts of soap onto the floor when it is not used. Thank you for your review, james! We are sorry this 30 oz. White Bulk Soap, Sanitizer, and Lotion Dispenser (IMP 9330) - 4 1/2 inch x 4 inch x 6 1/4 inch has not worked well for you. A Customer Solutions Representative will contact you soon! Very nice soap dispenser!! easy to install - I use the screws I have 2 in my restaurant and it's easy to fill it ?? Love these bulk soap dispensers, we save a lot of cash by filling our own rather than buying expensive bladders, we use these in all stations, we use the foam for restrooms. We have used these several of these, but I think we will get a different brand or model next time. They tend to leak a little soap after the soap has been dispensed and the costumer has usually already moved his hands meaning the soap drips on the floor. We have even had it leak all the contents overnight at the handwash sink in the kitchen. Thank you for the review! We’re sorry this has not worked out for you. Check out our Soap Dispensers Buying Guide for alternative options. This is made for light use, It broke down within 6 months of use, it started leaking at first , then it would take several pumps to get going, then quit all together... I guess for the price...you pay for what you get. We’ve tried a couple of different dispensers from this site. We like this one the best and use it with liquid soap also sold here. One to two drops will be enough. All in all, this is a great soap dispenser. The removable back lets you mount it to the wall and is easily disassembled for quick cleaning. I would give it 5 stars except that it comes with printing on the front, and I'd rather it didn't. This soap dispenser is great. It comes with adhesive right on the back, we were able to install it in less then a minute. We like that we can see how much soap is left in the container. We've purchased several of these and will continue to do so for new locations. They are affordable, yet are still a great quality soap dispenser. Good soap dispenser, I use it in a public bathroom, and also in a store bathroom. can be used with any liquid soap. east to assemble. I bought this soap dispenser for my daycare. My regular soap bottle would squeeze out too much soap for the children. This dispenses the perfect amount for tiny friends. What a great deal on this soap dispenser. Works fantastic and easy to refill instead of those expensive soap refills with other dispensers. Love it! Over time it starts dripping when not in use. The flow of soap is really good and has lasted me a long time but the soap starts dripping slowly after a months use. This is a really good price. The 30 ounce capacity is great, less refilling of the hand soap dispenser. Super easy to install, and refill. Thumbs up. This is a decent soap dispenser. I wouldn't purchase this again if I had the need. The dispenser button seems to take a few presses to get an appreciable amount of soap out. You can not beat the value of this soap dispenser. Works with almost any soap, super easy to mount and even easier to fill. Sometimes has a small drip but not a big deal. These 30oz Dispensers are fantastic! They can be drilled in easily! You can clean these very quickly! I bought several and don't regret it! I will definitely be buying more of these! Ordered them for firehouse showers. Good quality with heavy plastic construction, look good and function well with easy install. Will see how they hold up. I like the look of this dispenser and the setup was very easy. It comes with double stick tape and screw holes for mounting. My only problem is that there is a slight leak that leaves a few drips of soap on your sink/floor per each time it's used. I'm hoping this goes away as the springs and pieces are used more and broken in. Keeping soap supplies near are sinks was a issue. Having something that you can fill up with any hand soap works perfectly. Easy to attach to the wall and works like a charm! We installed the dispensers using the adhesive on the back and so far the dispensers seem sturdy. Per the reviews, we are interested to see if they will become loose over time and require install with screws. Very easy to install just make sure you do the screw instead of the adhesive for a more permanent fit. These are compact to fit almost in any space. The biggest plus is that there very easy to refill, just snap lid off and refill. Very nice soap dispenser! Good looking and easy to install - I recommend to use the screws instead of only the adhesive. I have 2 in my restaurant and they work well. This Compact soap dispenser was easy to install and can fit basically anywhere. Easy to fill and clean, and also looks nice, plus can’t beat the price. Exactly what I was looking for. I love the refillable style dispenser because of the minimal waste that you get by using a single pourable bottle versus the inserts. This style dispenser also omits the struggle that can occur when trying to fit refill packs into place in other style dispensers. Do not use the adhesive that comes with this. Ours fell down and made a mess and we only had it full halfway. Better to use screws to attach. We appreciate your review, Kayla! We are sorry this dispenser did not meet your expectations. If you ever have any questions about the product that you purchased, please contact our Customer Solutions team. We order 3 of them to install in front service area, kitchen and restroom. It fits small space area perfect. The best thing is you don't need buy the expensive soap bags with this one. Arrived the morning after installing two of these dispensers to find them and a bunch of soap on the ground. I suggest you avoid the double sided tape and use the wall mounts. We love this soap dispenser! Easy to fill just remove top! Easy to mount too! We use this with the Gojo hand soap! A+ product. Great product. It's cheaper than other brand but the quality is certainly better in my opinions. It holds up very firmly after I put some screws through it onto the dry wall. Very happy. Well packed. Shipping was fast. Exactly size what I wanted. I choose this because it is for bulk hand soap, and clear material I still can see when I have to refill it. Has nice price to compare any other sites or stores. Great design small size to fit into any restroom works so far with noble chemicals soap sold on Webstaurant without any leaks so far! We found that even a half squirt works usually for one hand wash.
For the price on this dispenser, you cannot go wrong. This dispenser has been in use for awhile now and it has performed flawlessly. We will definitely continue ordering these as they are needed. these soap dispenser works amazing and the best part was it was cheap! it work so much better then the one purchase for RD for so much more. i would totally recommend to my friends. Needed something cheap and good looking for my kitchen area. This definitely does that job. Good size for low to medium traffic area of use. These are great soap and sanitizer dispensers! I bought a few of them to use everywhere so that I don't have to use a specific type of refill. Replaced our old, cracked dispensers with these and they work great! The price is perfect and have had no trouble with the sticky mounting verses a screw. in 24 years in business it has to be the worst soap dispenser i have ever purchased, it leaked since day one. Just a terrible product and do not recommend this product to anyone. We appreciate your review, Luis! We have determined that your dispenser was defective and we will be resolving this issue for you! What a soap dispenser! Real cheap too. Does the job. Easy to install. Used the stick pad! The price is right! Get it from here! perfect economy soap dispenser. No need for more expensive models. Easy to install and easy to refill when empty. Clear window allows you to view the level of soap. i had initially bought electric ones but i had them replaced with these because of the price on the soap of the others. These are so simple to use, as you just refill with any soap you want. Very easy to install, you can install with the supplied screws and wall inserts, or the double sided tape, also included. Works well, easy to fill and clean, never leaks. Thank you for your review, Rosemarie! We are sorry this product did not work for you, please contact our Customer Solutions team as soon as possible if you have any concerns about products you have purchased. This item is good for the price. The down side is that it's NOT HEAVY DUTY. For the Price its hard to beat. Leak test before you install becasue my item came with a small crack I just trashed the item since returning the item would cost me too much time. Over all its a good item for the price. Good luck. Great quality product that meets the requirement for the health department. We are a small shop so buying the special fit soap bags is just not a cost effective for us. Easy to mount and remove for cleaning. Great dispenser at a low price; completely satisfied with the purchase of this item. Seems sturdy, very easy to install and refill. The only thing I do not really appreciate is the ugly advertising printed in the front of the product (WebstaurantStore's print in front of product), but if you don't mind that, then I definitely recommend this product. For such a low price, this product is great. It easily mounts on the wall. We purchased two - one for our kitchen and one for the bathroom. They are also easy to add soap to. Another great feature is that it’s see-thru so you can easily see when you need to refill it. This dispenser was easy to adhere to the wall ( I used the sticky tape provided), however it often leaks soap that I put into it. I don't know what caused it, but I think it is related to whether or not you fill it all the way up or not. Just make sure to place it over a surface that can be cleaned frequently. Value for money easy to unstall and use, we used screws for safety. Looks good, it takes less space to install. Using at a gas station restroom. I bought 2 of these one worked great and the other one wouldn't pump soap. I was refunded for the product. The one that works, works great, use it dozens of times a day. Don't let the small size fool you. These hold a good amount of liquid soap, and we haven't had any issues with leaking. The see through design makes it easy to know when more product needs to be added. Perfect soap dispenser. using it for about year and got 4 of them and they all still work the same. it wont leak and no spill what so ever. this soap dispenser is nice, great price. I have 1 in the restroom and one by the hand wash sink in the kitchen. I like it very much. This mounted very easily on the wall and is very easy to add soap to. It is a great product and I would definitely recommend this item to anyone. Got more than a few of these around the restaurant, and they have not failed. Use both a screw and double sided tape for a great hold. I am sure these will last for awhile... Cheap enough to replace every few years I am sure! The dispenser has a clear face so its easy to see when its getting empty. It dispenses a decent amount of product to complete any of your needs. I purchased 3 soap dispensers. They are very good price compared to different places.i love that I can add any liquid soap of my choice. Ordered two of these. Both arrived at the same time and in excellent shape. however, one of them leaked continuously no matter what kind of soap we used. I swapped it out with the other unit and that one worked fine. Perhaps I just got a bad one, but one out of two isn't great odds. This is a great quality, simple soap dispenser. We use is for hand sanitizer for our customers and it works perfectly. It's super easy to refill, and to see when the levels are running low, unlike our old one. Great buy! Wow is all we can say about this soap dispenser. Great price, extremely easy to install (all you need is a drill or screwdriver) and really like the fact that there's a peel and stick back that allows easy install. This is z great price for a soap dispenser. I like that you can just open it and pour in whatever kind of soap you want to use. These are the perfect size for our restrooms. The only flaw I see is that sometimes they drip- luckily we have them placed directly above the sink and it usually isn't an issue. We always had issues with the overpriced foam soap- now we can refill these at a much cheaper cost! 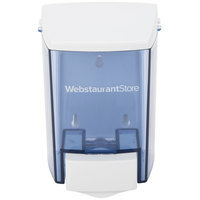 Was looking for a soap dispenser and decided to give the webstaurant house brand a shot. No complaints! It works great and has an attractive color! I've had it up for a few months, and it's worked flawlessly.